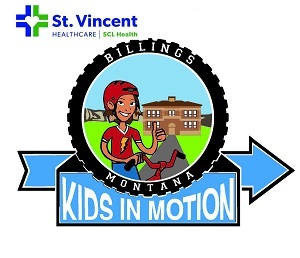 Kids In Motion “KIM” is an active transportation educational program, encouraging young people and their families in the Billings Community to make economic and healthy transportation choices to reach schools, their friends’ homes, and stores. KIM is sponsored by St. Vincent Healthcare and facilitated by Billings Public Schools, The Education Foundation, The City of Billings, and other community partners. Started by AmeriCorps VISTA members, KIM is the main component of the “Alternative Modes Outreach and Education” project and is directly overseen by the City-County Planning Division. KIM’s main efforts surround facilitating educational bicycle tune-up clinics for lower income students and developing community-focused active transportation educational materials. Empowering youth to make safe and healthy active transportation decisions when traveling, KIM reinforces the skills and confidence all youth need to walk and ride their bicycles every day! Bicycle Tune-up Clinics: With the help of enthusiastic community volunteers and experienced bicycle mechanics, KIM is able to bring bicycle tune-up clinics to eight schools a year. They are able to serve over 250 students per year and repair over 200 bicycles. Examples of minor bicycle repair include: Inflate and/or replace tires and tubes, general adjustments including brakes, seats, and chains. KIM also provides a wealth of educational activities, such as bicycle skills and traffic courses, helping youth learn to conduct simple bicycle maintenance. In-Class Education: KIM is starting to implement a focus on the built transportation environment into local classrooms, through the partnership with Billings Public Schools. Starting in spring of 2016, KIM was given the opportunity to conduct multiple educational pilots at Billings Public Schools. Fourth graders at multiple elementary schools were introduced to KIM’s Active Transportation materials, and fifth graders at Broadwater Elementary were engaged with new educational activities. Encouraging active transportation is the healthiest option, and KIM sees a day where the Billings Community, regardless of age, is encouraged to make the healthiest transportation choices possible. Posted in Active Living, Yellowstone and tagged Bicycle program, Building Active Communities, Community, Healthy Living, Safe kids.